pokerrymon - "My Brother is Notch"
Seivelath - "I am from PMC"
Credit All you people out there that have ever said this! 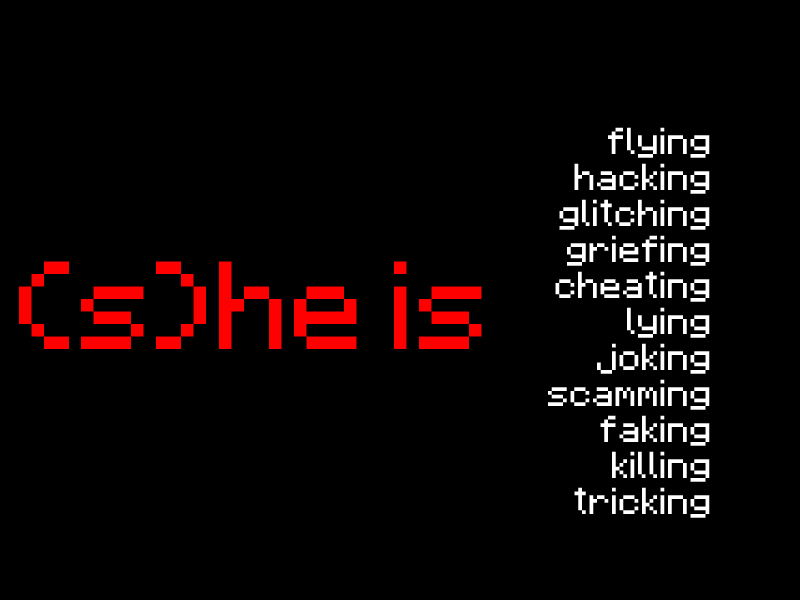 Some People Tend To Talk Like This Which Can Be Pretty Annoying And Smart*ss Like Because You Can Emphasize Your Words But It Is Not Seen As Caps Spamming. I Will Stop doing this now. My eyes exploded reading this. 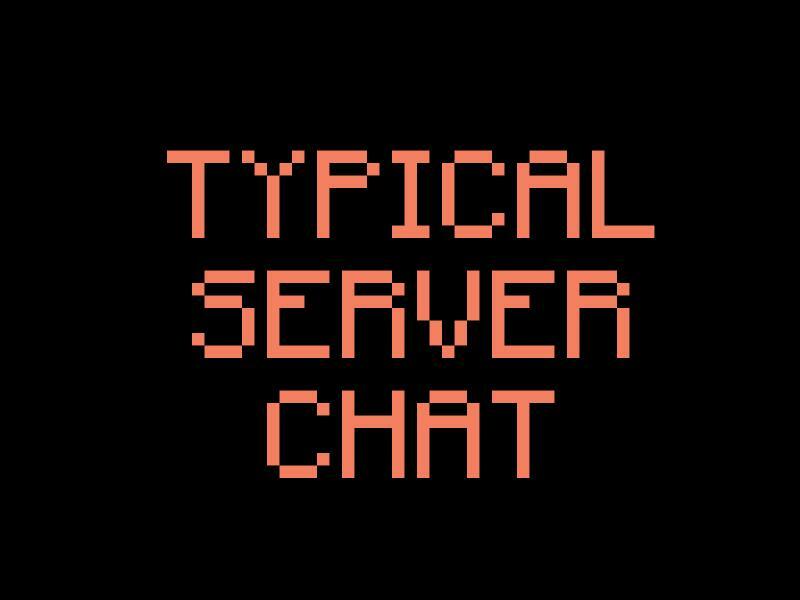 It's all my MC chat pet peeves in one layout. How about spammers that put several lines between your conversations? [Buttlicker 1] : HI OWNER! [Buttlicker 2] : OMG it's the owner! [Buttlicker 4] : Hello there! 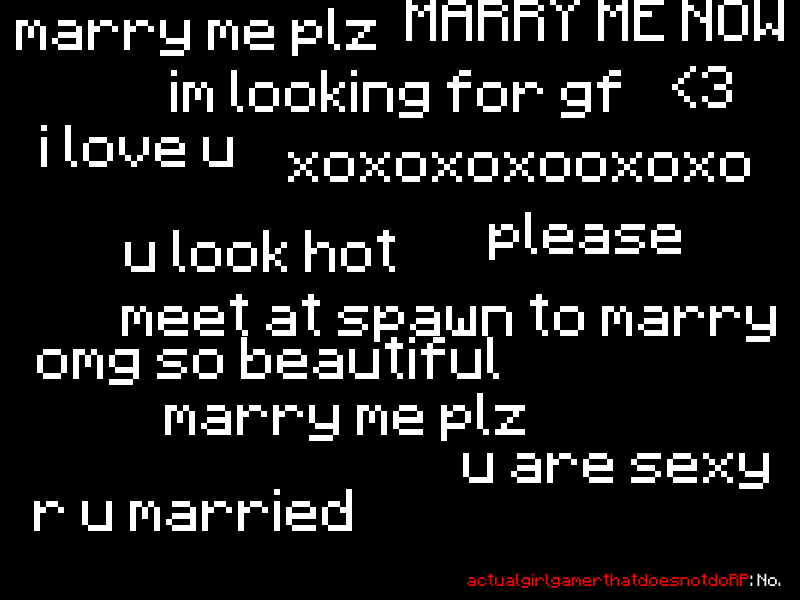 [Buttlicker 6] : I donated to your server Your so awesum yesh you ar! 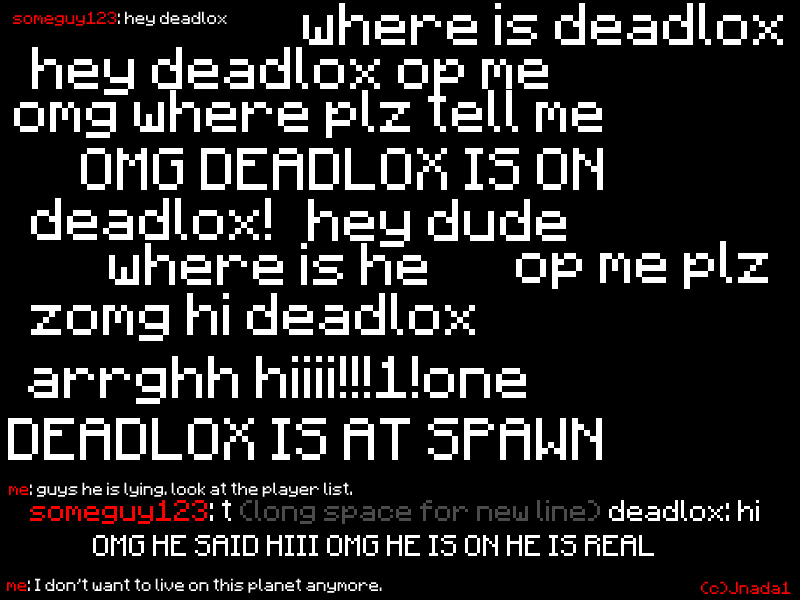 [Randomplayerthatwasonlineforalongtime]: IS THERE ADMIN ON I NEED HELP HEEEELP NOW PWEASE HELPMAH NOW!!! C'mon the admin was talking to me just before that! How stupid can people be XD. stupidusername has joined the server! stupidusername can I be op? chpbrownlee rule # you will be banned the first time you ask for op. Elite Butter Overlord <SkythekidRS> Hey guys Sky here. And then people somehow believe them. Wanna know what I do when stuff like that happens? 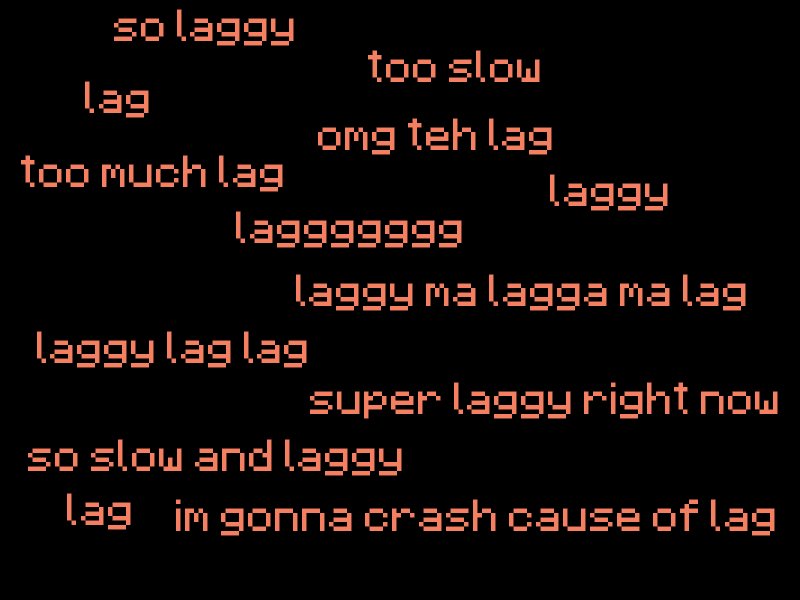 Yeah, with all these plugins and teen influences, this happens nearly always on some very popular servers. 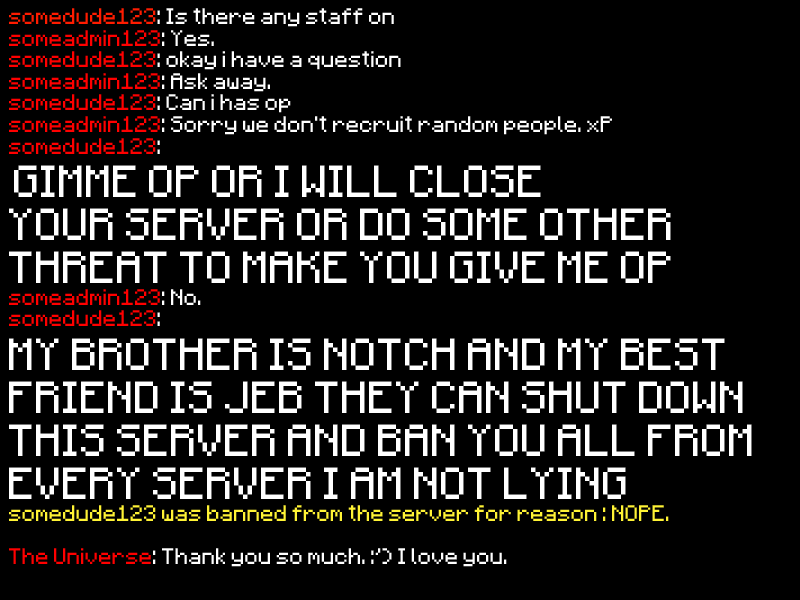 I just saw my servers chat, creepy. Ha! This is so true, Or when they say they are from PMC and its like "Yea so am i. I have an account on PMC and yea." It's bad how true this is. that 3rd picture reminds me of planet minecraft's current status "its butter not gold"
you get the people who come onto say a hungergames server and go Is this a creative server? can i have GM? Here is something like this that happend to me. [Me --> tickandtock] Lets ask him for a link to his account. Me: Hey nub123 can I have a link to your accont. Me: Ahh, I see then no promotion. nub123: U ALL SUK I WIL GET CYPREZZ AND PARIL HER AN BAN U FRUM PMC SO GET A LIFE AND OP ME. The ban hammer has spoken. I hope some people who spam like this see this blog and think about it. Some might, but then they won't actually care. Welcome player to the server! TehOwner: Why should I give you op? TehOwner: Why do you want to review my server? Player: Because I want to review a server, and I saw yours. TehOwner: Ok, go off and review to your hearts content. Player: FINE THEN, I'LL GIVE YOU A C**P REVIEW THEN AND NO-ONE WILL COME TO YOUR SERVER!!! 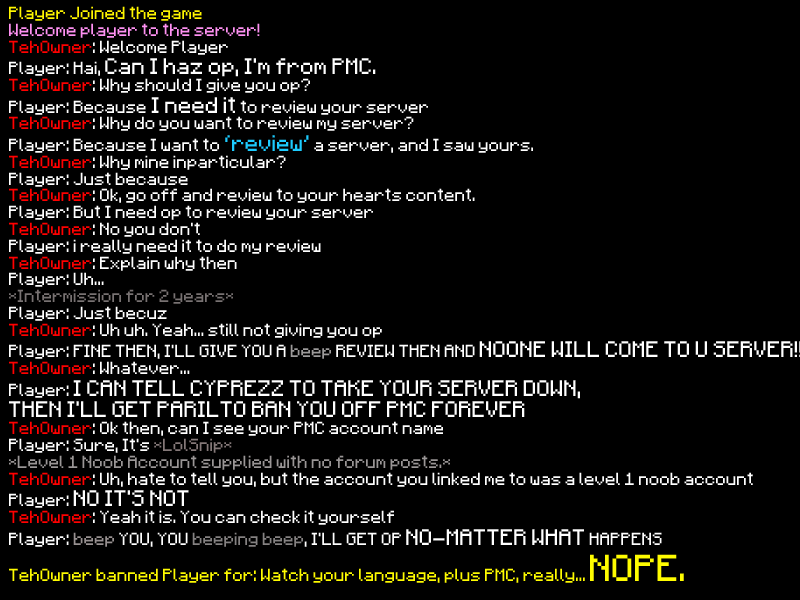 TehOwner banned Player for: Watch your language, plus PMC, really... NOPE. I will add that now. :D Nice Find! xD you kind of just have to ignore it. and HOW DO I MAKE PIKAXE!!!!!?!?!? Indeed..but I've been on lots of servers where this stuff in the chat is quite rare. 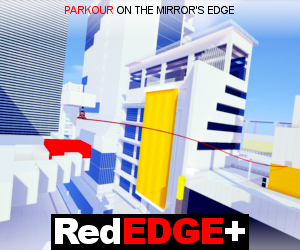 Yeah, this is mainly on the popular servers. With the MEGA fans and noobs. Ha. Yes. Sort of and sometimes. It's sad... BUT IT IS ALSO TRUE! HAHAHAAHH! Diamond. Fav. Thank you! This is currently my most popular submission. :D I am shocked by how quick it got diamonds.